Having a fun park or a match night to watch some of the matches with clients and staff is great. The sport is good for morale and camaraderie, it brings people together and gets them interacting and communicating more effectively. So you've got your venue, and you've invited your clients and staff, and you've ordered the drinks. The TV's all set up, and the evening is going to be a great success. But wouldn't it be great if they could take something away with them. Something to remind them of the great time they had, and something to remind them of you, who hosted the evening. We've got some ideas for you. Every business is different, and you're going to want to pick something that suits your client. 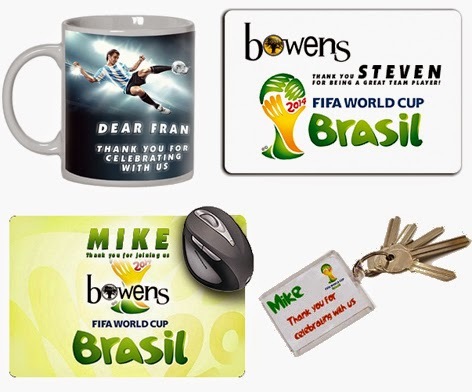 Here are a few examples of key rings, mugs and mouse pads. Make sure that you brand and personalise the merchandise, it just means that much more when it's personal and they're more likely to enjoy it and use it. It's great to have your logo on there. After the event, you could also compile a photo book, show off pictures from the evening, caption some of the revelries that transpired, and let the event live on a little longer in the homes and heart of everyone who attended. These extra little additions are extremely valuable in maximising your world cup event.